DIY Boeing 737 Overhead Panel - Part 3 - Moving Gauges | Life, The Universe and ... Everything! 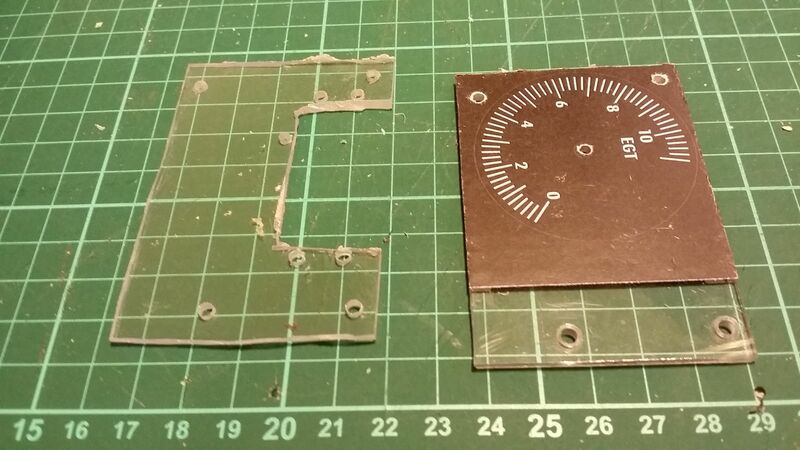 Although I had planned to work on the annunciator lights next, I was still waiting for some parts, so in the meantime, I started work on the overhead panel's moving gauges. The 737 overhead panel has a number of gauges with needle indicators. Earlier, when I made the panels, I had cut out circles into the panels wherever the gauges are, and so now it is time to work on the actual mechanics behind the gauge. I used 2mm acrylic (RM5 per sheet from Art Friend at The Curve shopping mall), as I needed it to be quite rigid. 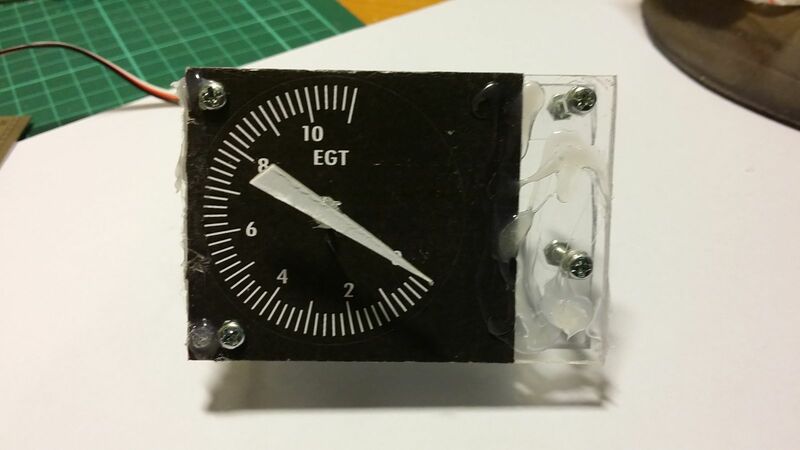 To begin with I printed out the gauge scale from Peter's Overhead sheet, and spray glued it onto a rectangle piece of acrylic. 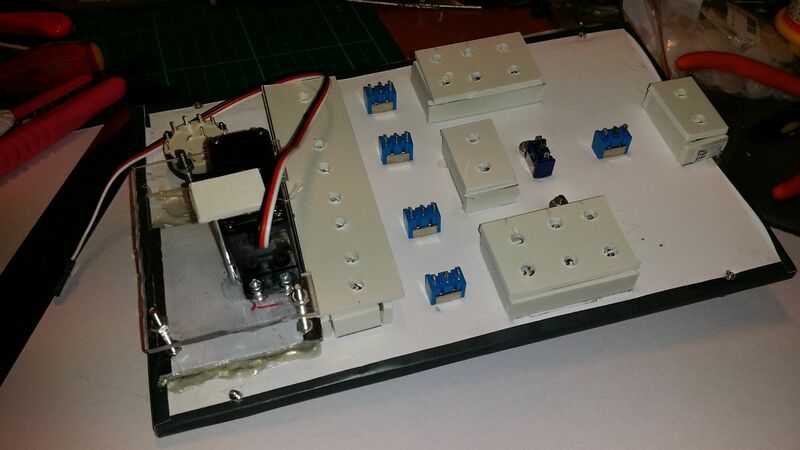 I laid two pieces over each other, and drilled four 3mm mounting holes to attach them to each other. I also drilled 2 mm a hole for the spindle dead center of the gauge. I also made a cutout for the motor to drive the shaft. The usual"score-and-snap" method didn't work too well for this, so I used my rotary tool with a cut off wheel to cut the acrylic pieces to shape -- it's a bit messy but accurate enough for the purpose. Tip: do not drill the holes for the servo mount until later. I used a 2 mm metal shaft as the spindle (bought a pack of twenty 2mm x 60mm for USD2.24 on eBay). I cut out a needle from some thick card and stuck it on the end of the needle with some hot melt glue. To drive the spindle, I used a Futuba S3003 servo motor, also bought on eBay (USD 3.73 each). Servo motors work by receiving pulses from the controller, with the duration of the high pulses indicating the angle at which the motor turns the spindle towards. A duration of 1.5 us moves the servo to its center location, and larger or smaller values will cause it to rotate to the appropriate direction. 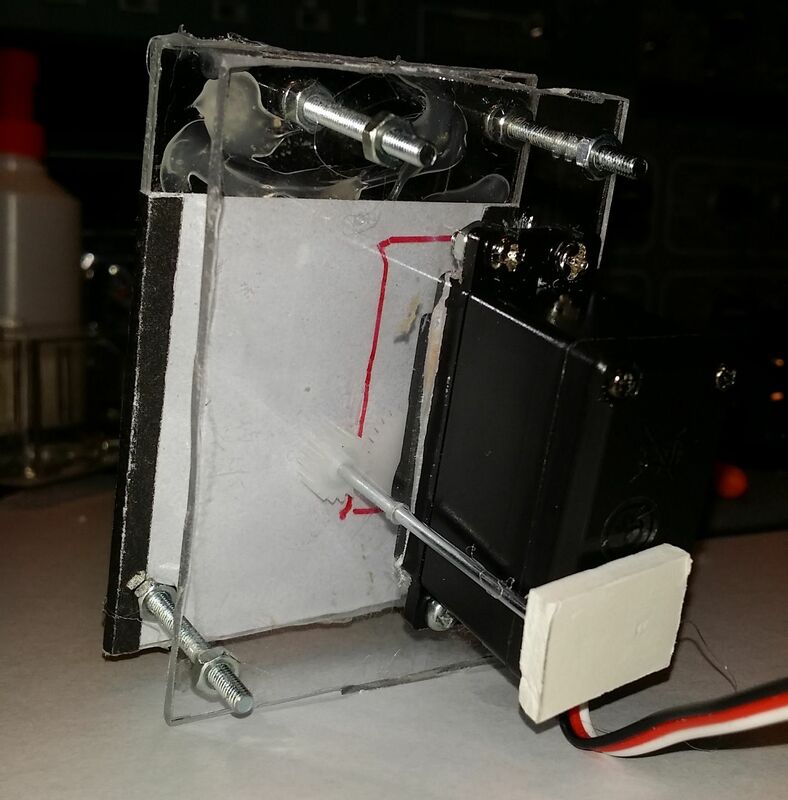 The servo was fixed to the rear acrylic plate using its mounting holes. The servo does not rotate a full 360 degrees, but rather it has a limited range of around 90-180 degrees. To translate this to the larger range required, I used two gear cogs, with a large cog having 36 teeth fixed to the motor's shaft, and a smaller cog with 18 teeth (for a 2:1 ratio) fixed to the gauge's spindle. This way, a half rotation on the motor's shaft provides a full rotation on the spindle. It's important to select gear cogs that are large enough so that the spindle shaft can clear the motor's body. Also it helps if cogs themselves are thick so that the don't have to have perfect alignment to work. 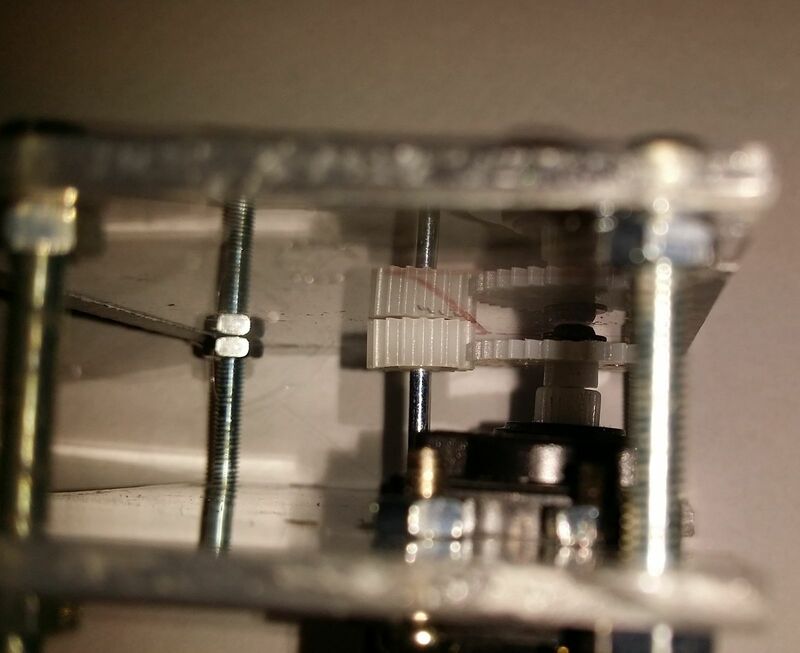 There cannot be any free play between the spindle and the motor, as this will cause the gears to slip. I found it helped to drill the screw holes for the motor only after ensuring a good contact was achieved. I fixed the entire gauge to the back of the panel using some hot melt glue. I glued a small piece of pvc foam to the back of the motor to hold the spindle in place (Ideally this should be replaced with a springy metal tab so it can be opened and replaced easily -- I need to be able to free the spindle from the gear cogs so that the needle position can be calibrated correctly with the where the motor thinks it should be). For this stage, I used a servo tester, which is a small 5V powered box that lets you turn a knob to control servo motors. It has three modes: In the first, it sends out pulses of the approriate duration based on the knob position. A second mode positions the servo in its dead-center position, and a third mode continuously moves the servo through its entire range of operation. 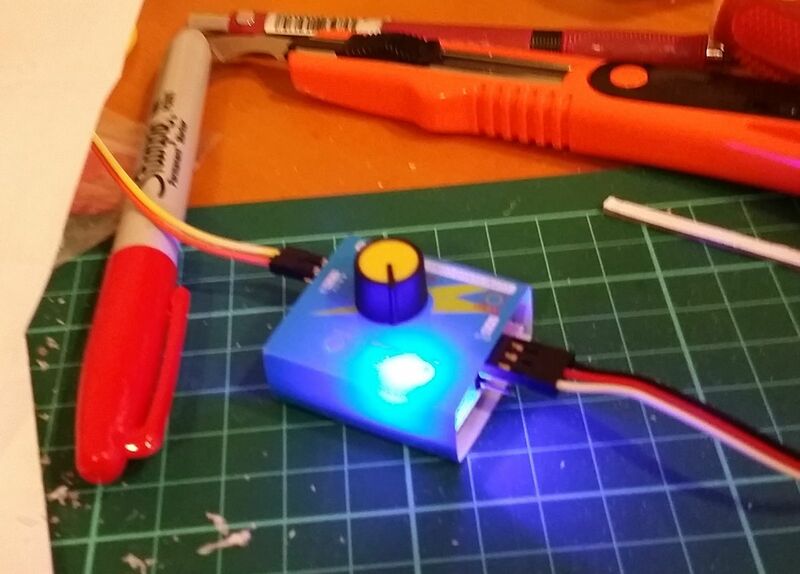 Here's the servo in action. I suspect I'm not getting the full actual range from the servo tester ... will know further when I work on the controller where I have better control over the actual timing of the pulses. One of the gauges has two needles ... not sure how I will deal with that yet. I've bought a cheap IKEA clock to steal the concentric spindles from.